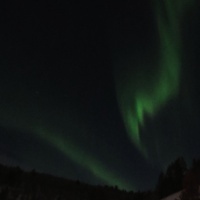 The last time I saw the Aurora Borealis phenomenom, I was traveling in the Geavu Wastelands of Northern Lappland in december 2013. I was in quite sad moods that time due to being left by the most loved one. I was in a need of some dangerous adventure. My travel companion was sitting in the driver's place, when we speeded towards Nuorgam, the Northernmost location of Finland. It was almost midnight and outside temperature was decrasing into 25 degrees subzero. I saw some faint clouds in the black night sky. Soon after I realized that there shouldn't be seen any kind of clouds, because it was pitch-dark outside. I asked my comapanion to stop by the next truck resting place. Saddly the next truck stop was unploughed and my friend unexpectedly crashed my rental car deep into a snow bank. I had a plenty of time to watch the Northern lights, before an ukranian tourist convoy stopped to help us out. In June 2014 I was studying guitar distortion effects, when I tumbled into a Finnish site dealing with leisure electronic researches (Harraste-elektroniikka). There I saw a project named LED Finlandia, where the builder had assembled LEDs inside a decorative Vodka bottle. Of course I had empty Finlandia Vodka bottles, because we are talking about our national drink. So I decide to test my rookie electronics skills with a samekind of project but also taking it a little bit further. The project took one week of hard-core engineering, designing and adjusting, which was quite a challenge for me. Electronics are not the strongest abilities for a bridge engineer, but the nerdy determination won in the end. As an outcome I build my own version of LED Finlandia with 16 "randomly" twinkling LEDs. The unintended orientation of LEDs formed Aurora Borealis-like shapes on the wall behind bottle, witch looked quite cool. Light took it's pover from the 9V DC battery or in this case mains current (230V AC) via 12 V DC transformer. As an extra feature I also uppgraded the circuit with a light operated switch using single photoresistor and adjusting potentiometer. Ambience light's schematics are quite simple, but I recommend every builder to test it on breadboard first. 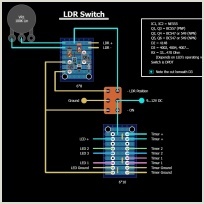 Certain components may need little adjusting depending on which LEDs and power supply are used. Basically the circuit consists three power channels, which operate three separate LED panels. Channels are created with two NE555 timers, which oscillates output voltage in different period times causing LEDs to illuminate simultaneously in the same channel. 1. channel: 6 LEDs illuminate in the combination of channels 2. and 3. 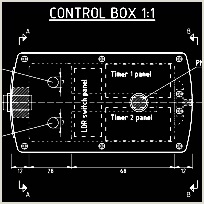 More detailed instructions are presented in the Schematic PDF. Light operated switch turns the LEDs on, when the amount of light falling on the photoresistor decreases. Using two transistors makes the swich more accurate in the threshold darkness, which improves circuits function. 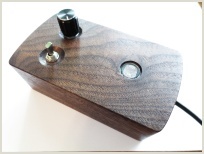 Circuit includes also potentiometer to adjust the threshold darkness. 1. LED-panel with 3 channels. With two timer circuits you can build up to 4 LED channels, but you have to remember how they can be easily fitted into a bottle. On veroboard they would need atleast 6 strips to keep it simple (1 channel→2 strips, 2 channel→3 strips etc). I decided to go with 3 different channels and 5-strip-board. In this point you should also have a plan, how the LED panels will be hanged in the bottle. I went with a little oversized board and drilled two dangle holes in the top side. You should use only the one kind of LEDs in single channel, since different LEDs have their own operation voltages. If you use multiple different LEDs in the same channel, test the circuit before installation. In this project LEDs were attached into both sides of veroboard via pin sockets. In that way it will be easy to replace broken LEDs later and also test some other colors. Two similar timer circuits were made. The only differences between them were components affecting to LED channel's period times. 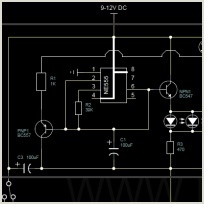 See the schematics and adjust the circuit as you like it. I added DPDT switch: In the A-position all LEDs are illuminating constantly. The B-position attaches the light operated switch into circuit and LEDs will not shine before the threshold darkness has been reached. Because I had so many separate panels and may wires, I also added the LDR panel with connection area with pin sockets, which connects the whole circuit together. In the next uppgraded version I will build the whole circuit (except the LED panel) into just one veroboard. Either way this worked nicely in the prototype. The form has been assembled with salvaged parts. It's rude but still works.